The combined activity of collecting and/or hauling of hazardous waste materials within a local area and operating treatment or disposal facilities for hazardous waste. Operating nonhazardous waste treatment and disposal facilities (except landfills, combustors, incinerators, and sewer systems or sewage treatment facilities)–are classified in U.S. Industry NAICS 562219, Other Nonhazardous Waste Treatment and Disposal. 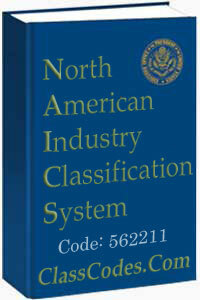 The suggested cross reference guide for NAICS code 562211 is based on our research using the resources cited above.